Welcome to the John Muir dance blog! This monthly feature opens a window into our dancing practice and process. 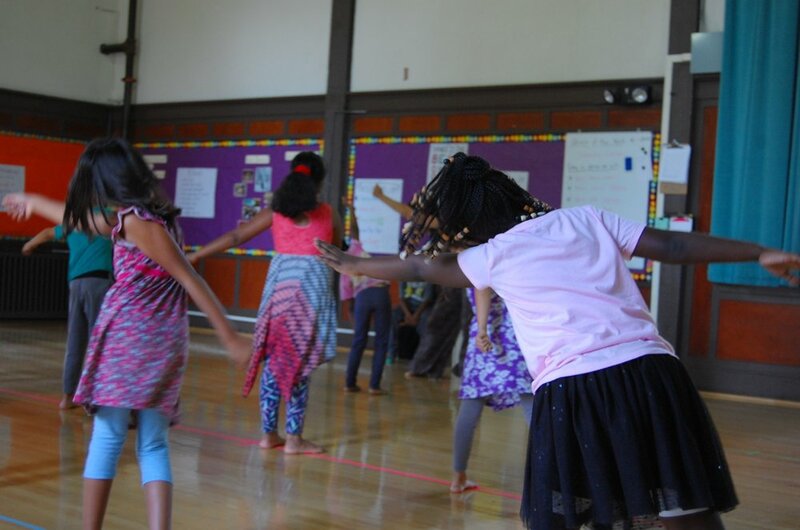 Each spring, I ask John Muir third graders to explain our dance program to new students, and to people who are unfamiliar with dance in schools and the arts in general. In times of dwindling resources and increased focus on academic achievement, it is easy to overlook the importance of arts education for children’s physical, emotional, social, and cognitive development. The students’ words, compiled here, are a powerful support to the academic research about the positive and long-lasting effects of multi-year movement education, and their conclusions are the same. Why Do We Dance At John Muir? To express ourselves. We communicate through dancing because when we’re dancing we express our feelings differently than when we’re talking. If you use dance to express something, and then forget the feeling, you can repeat the same dance, and remember. To learn. To expand our memory. To learn more things. We dance now so we can dance better when we grow up, like Michael Jackson. It helps you to understand things about dance. When you grow up, it can be your career – we learn a lot in 6 years! How do you think professionals get started? They go to dance class and LEARN. To have fun. You’re supposed to have fun learning. We dance because we want to, not because we have to. We don’t dance because teachers tell us, “You have to do it THIS way.” We do dances the way WE make them, and that is fun. We do dance because some people think it’s interesting. Dance is good exercise, and it gives you more energy. It is part of your physical education. It helps build your muscles. It’s good for your health. We dance to stay calm, so that after we dance, all the crazy energy is out, so we’re not distracted. To build character. You learn how to express your feelings in performance. If you have a fear about dancing with other genders or about performing, you can learn to overcome it. We dance to build memories. Dance is good practice. We dance to have teamwork, so you can learn about someone who isn’t your friend, even if you speak different languages. You learn to dance with all genders. You learn to keep dancing no matter who you are partners with. Dance helps us work with other kids. Dance helps us build our personalities, and how we affect each other. When we dance together on teams, it helps people on the same team learn to respect each other. When you learn to respect each other, it changes the way you think about them and the way they think about you, and then you and they can become friends. Dancing is one of the arts of learning.